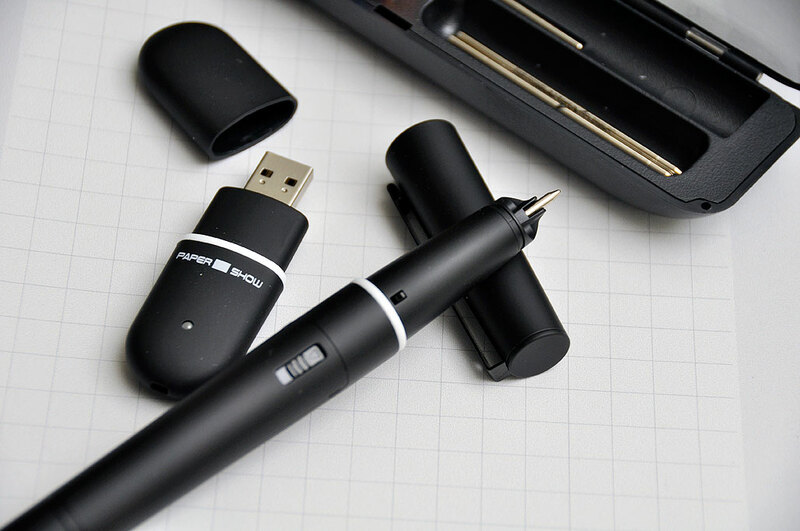 The Digital Pen was invented and developed by a Swedish company called Anoto. A digital pen looks, feels and writes like a normal ballpoint pen. However, it contains an integrated digital camera, an advanced image microprocessor and a mobile communications device for wireless connection. The pen is able to determine its exact position when used with special encoded paper. The non-repeating dot pattern printed on the paper is a set of coordinates trackable by the camera at the tip of the pen. This information, combined with the image of the ink, enables the pen to record exactly when, what, and where something was written. Anoto licenses this technology to a variety of companies who then use it to make products which target different markets. Many of the uses are purpose-built for vertical sectors such as healthcare, finance, etc. However, some companies have created products aimed at general business and consumer market. Most know Canson as a French company with a large line of fine art paper and related products. 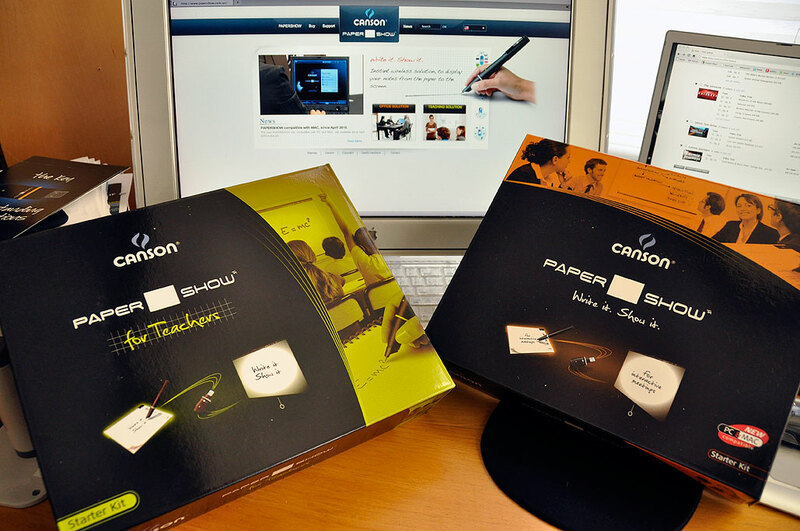 Today, we are going to take a FirstLook at a product from Canson called PaperShow. RainyDayMagazine readers will immediately recognize that the pen in the Canson PaperShow looks very similar to the Livescribe Pulse SmartPen. Both are based on the same Anoto technology. While the Livescribe Pulse is geared toward note-taking, Canson’s PaperShow is more presentation-focused. PaperShow is a presentation tool which makes it possible to project one’s handwritten notes directly on the screen. So instead of just talking about what is on the screen, a presenter can annotate the presentation in real-time. This simple act can dramatically engage the audience and liven up a talk. The PaperShow package contains the interactive paper, a digital pen, and the necessary software on a USB key. The Canson PaperShow paper is similar to those used for the Livescribe pen. On the side of the pages are controls specific for the Canson pen. The dots are almost invisible to the naked eye. The pattern consists of numerous small black dots and indicates the exact positions to the digital pen. The pattern on each sheet of paper is encoded such that each page can be uniquely identified. For brainstorming sessions, multiple pens may be used at the same time. If you are like us, sitting through presentations and looking at PowerPoint slides are about as much fun as getting your teeth cleaned. In many cases, it is not all that much fun for the presenters either. In fact, research has shown that more people dread giving presentations than going to the dentist. The problem with some presentations are that they are not two-way conversations. The speaker is talking away while the audience is thinking about what’s for lunch, checking email, or has zoned out completely. To engage the listeners, the presenter has to do more than just talk, has to get the audience to either mentally or physically participate in the dialog. The Canson PaperShow is designed to help a presenter do just that. The PaperShow is an intriguing tool. How does the pen perform in real life? Does it make presentations and group discussions more interactive? In the upcoming FirstUse write-up, we’ll take a look at the PaperShow pen in action. We’ll also take it out InTheWild and see what others think.